1. Dough: In a small cup, combine the warm water, yeast and sugar. Stir together and let sit for about 5 minutes. In a medium mixing bowl, combine the flour, salt and yeast mixture. Add the olive oil and knead until a smooth ball of dough begins to form. Place in a oiled bowl and cover. Let sit for about 1 hour. 3. Caramelise the onions: In a skillet cook the onions in the oil for about 10 minutes. Add the honey and cinnamon. 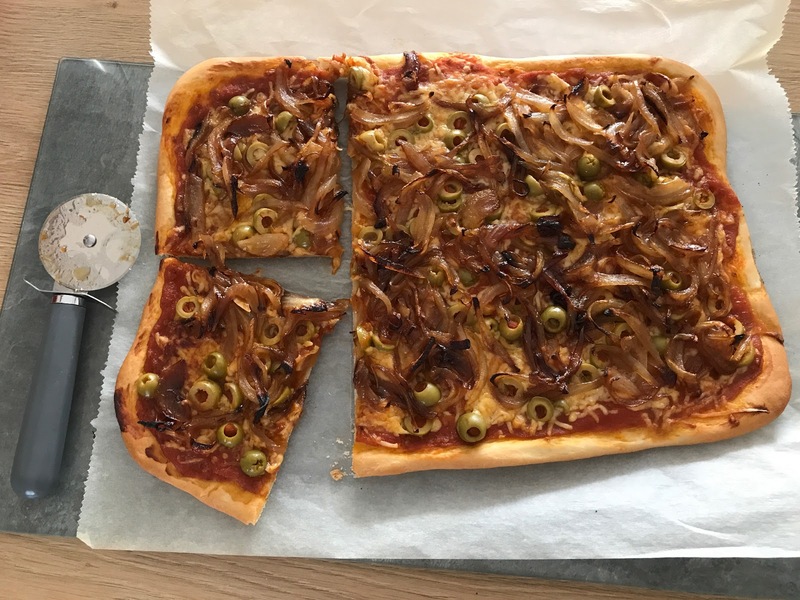 Cook for 10 to 15 minutes more over medium heat. Set aside. 4. Make the sauce: In a saucepan, cook the chopped garlic clove in the oil. Add the canned tomatoes, spices and salt. Reduce the heat and simmer, uncovered for about 8 minutes. 5. Preheat the oven to 220C 428F and line a baking tray with parchment paper. 6. 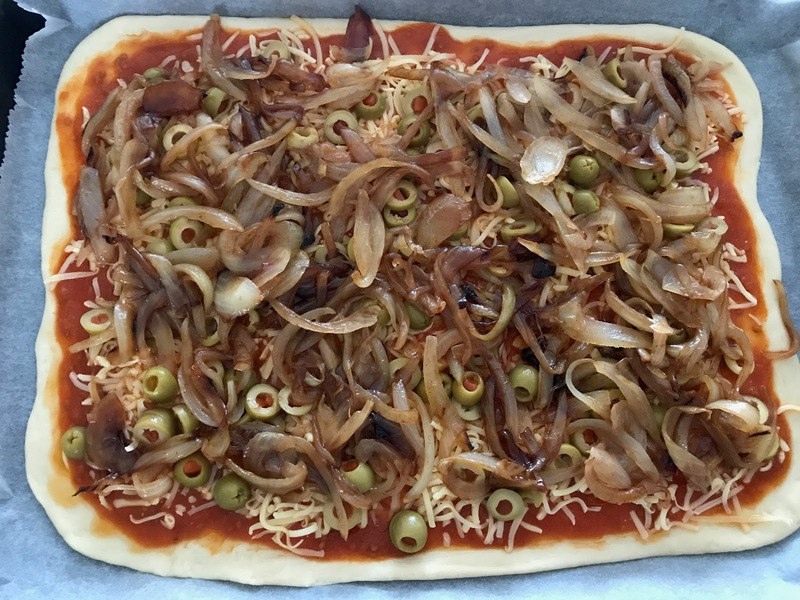 Roll out the pizza dough and place on lined baking sheet. 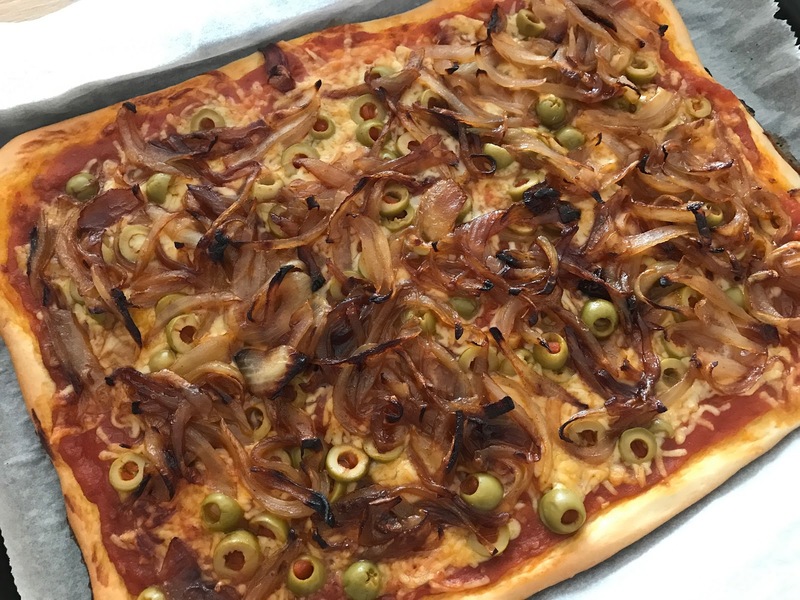 Top with tomato sauce, cheese, olives and onions. 7. Bake in preheated oven for about 25 minutes. or until golden brown.